This photo came as part of an email my father forwarded to me. As a former employee at a major airline, many of the humorous emails he receives (and often forwards) are related to his former industry. I didn’t take the time to fact-check this one, but I found it funny enough to share with you as a bit of midweek levity. According to the email, the pilot of this Boeing 737-200 (an aircraft that is pushing 30 years old if not older) was departing a small airport in South Africa during the night to ferry the plane back to Johannesburg. The pilot got confused on the taxiway and reached a dead end without the room to turn around. His solution was to engage the thrust reversers and back out of the dead end, trying to perform a three-point turn. Unfortunately, he backed the plane into a culvert alongside the taxiway. To make matters worse, he tried to get the plane back onto the taxiway by throttling up the engine. The end result was that the engines ingested all sorts of rocks, dirt, and other debris since they were resting pretty much on the ground. The damage was such that the cost of repair exceeds the airframe’s insured value and so the craft will be written off. No word what happened to the pilot. Of course, silly things happen all the times. 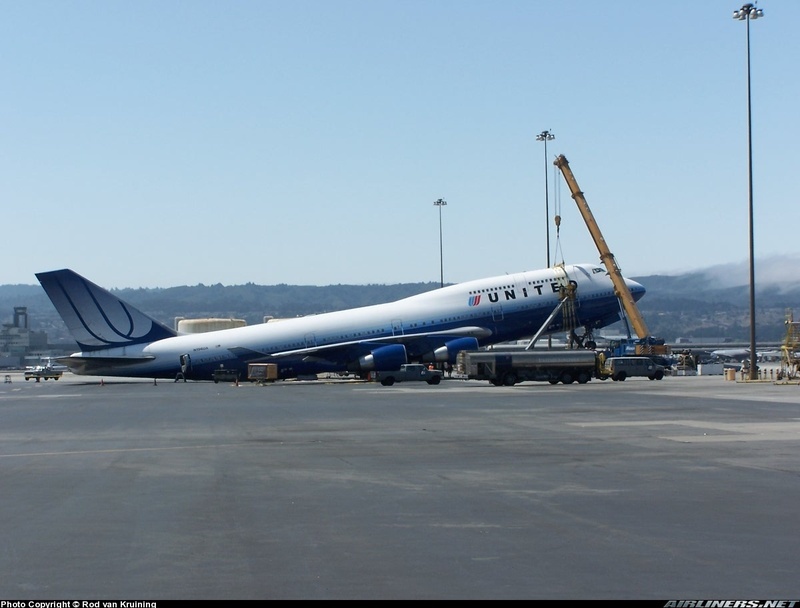 Back in August 2005, a mechanic at United Airlines’ San Francisco maintenance base accidentally retracted the main landing gear on a Boeing 747, resulting on the plane resting on its tail. Fortunately, no structural damage was caused and the plane was back into service after a thorough check. No word on what happened to the mechanic. This entry was posted in Uncategorized and tagged aircraft, Airplanes, aviation by christao408. Bookmark the permalink. This is sad and hilarious at the same time. I love the deadpan last sentence- “no word…”Some people don’t think everything through! I hate to admit it, but this kind of reminds me of my driving habits when on the cell-phone, until I finally got caught and paid my ticket to the State of CA for the sum of $356.00. Maybe these two men were texting their girlfriends??? HA! haha! well, to be fair on the first one…i probably would have thought to do what the pilot did….then again, maybe there’s a reason i didn’t score high on the pilot aptitude test. LOL! Haha. This is funny even though the reality isn’t remotely so- possible job loss and millions of $$$ damage! aah, these are so funny and sad at the same time. Especially since most of us don’t always realize the millions of dollars that it takes for seemingly simple repairs. I remember hearing some really funny stories from Bill when he worked on the ramp. At least there are photos to accompany them! Not a good way to start anyone’s day heh? I did laugh aloud at the “no word…” part. Too funny. Lol! The mechanic and that pilot are probably hiding out someplace together lol. Someone was asleep – or texting!!! Ok, the pilot of the B732 is just stupid. Oh dear, I am sure the pilot would have been fired. I had no idea you could retract a landing gear when the plane is on the ground. One would think there are sensors or something that would sound an alarm first. @ElusiveWords – When conducting hydraulic tests, they have to insert some sort of a safety pin that actually prevents the gear from retracting. From what I read after the incident, the pin had not been installed. @beowulf222 – You have to imagine that maybe they don’t have any tow tractors and a tow bar? Maybe that’s why he thought he should do it? @Like_A_Tigah – Or else they raised some funds and started their own airline! @Fatcat723 – @murisopsis – @icepearlz – Yeah, it doesn’t look good for his prospects of career advancement. @cmdr_keen – @Passionflwr86 – Oh, I’m glad you liked the “no word on the…” bit. I thought a bit before adding that. @stebow – Nor to end it! @Dezinerdreams – It is fair to saw that others found it funnier than did those people directly involved…@alextebow – Yes, I recall when I spent the summer working cabin services at UA there was a LOT of emphasis placed on just how much damage a small collision could cause. I remember one day a truck tried to drive under a portion of the terminal that was height-restricted. They crushed the top of the cabin service truck as well as the side of the building. Thankfully it wasn’t an airplane but they sure caught a lot of heat. 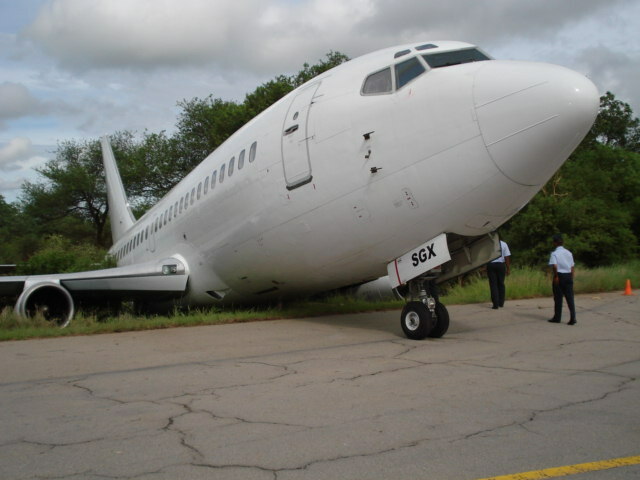 @Umnenga – There is no shortage of jokes about airlines and airplanes, although many of them seem to get recycled a lot. The jokes, not the airplanes. Ha ha…@yang1815 – They make the telling of the story oh so much better, don’t they? @wegotrhythm – Ouch, expensive ticket! Well, I don’t know what these guys were doing but it was certain they weren’t paying full attention to the task at hand. @ThePrince – Um, remind me not to fly with you if/when you get your license! Ha ha… Actually, I can understand why the pilot tried to do it, but I certainly would not have done it without someone spotting me on the ground. @christao408 – I can understand the idea of “backing up” but once he was stuck to throttle up … I mean, as a pilot he should know how low the engines are on his airplane. hahaha the pilot should have radioed for help rather than trying to back up by themselves… there’s a reason why planes are assisted when they have to back away from the terminal! actually, i’m rather impressed the pilot even tried to reverse — can they even see behind them? i doubt planes come with rear-view mirrors! @christao408 – haha. is that so, eh buddy? well, when i get my pilot’s license, i know who to take on my first transatlantic flight! LMAO! j/k hope all is well over there on your side of the world. @ThePrince – Are you actually studying for a license? @kunhuo42 – Open the cockpit window (can do) and lean out, I guess. Quite a large blind spot, though. LOL@beowulf222 – That part is definitely a big miss. Especially with a 737 classic. Sometimes it’s fun to wonder what goes through the mind of people the moment they realize they may have just destroyed a multi-million dollar investment! Like military pilots who eject out of a plane because they did something stupid.